This summer we're going to Switzerland. I've always wanted to go to Switzerland, especially since I got the Culinaria books and have wanted to sample all the cuisines of Europe. We quickly realized that we will be in Switzerland in the summer time so we wouldn't quite have the complete winter experience. No matter! We had planned the perfect ski weekend to emulate winter in the Swiss Alps here in New York State! 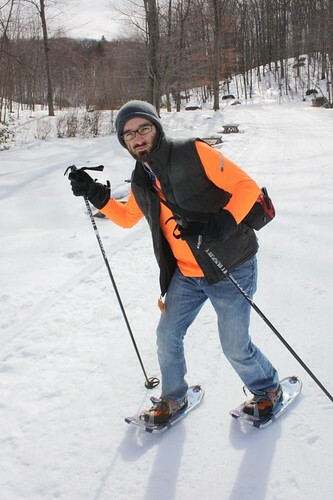 We started off by going showshoeing at Fahnestock Winter Park in Cold Spring, NY. I wanted to do cross-country skiing but for some reason Jen thought that my skiing skills were not great enough to do this. The only evidence she had to support this theory was that I've never skied before in my life. I still think I would have been nasty at some cross-country skiing. We rounded this off with some afternoon shooting. 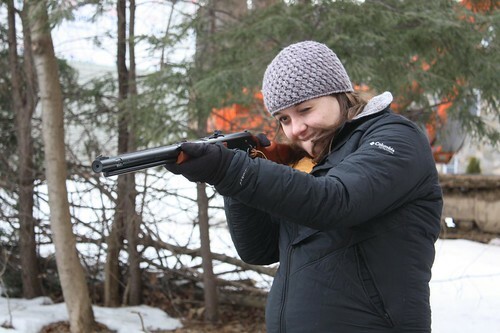 It was like our own little fake Swiss biathalon in upstate New York. Not our typical weekend day off. However, I feel that we are pretty much prepared for Switzerland after both these events. Given that I know nothing about Swiss cooking I decided to make dinner tonight with a vague Swiss theme to it. 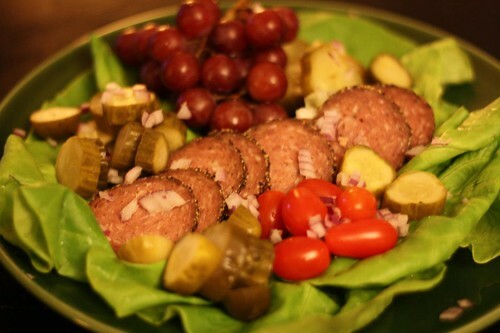 I served up some grapes, pickles, sliced salami, and grape tomatoes on a bed of bibb lettuce with chopped red onion. This isn't so much a Swiss recipe as it is what I imagine people in Switzerland will eat. It think our trip to Switzerland will be beneficial in the fact that it will show me what I am too lazy to actually research. 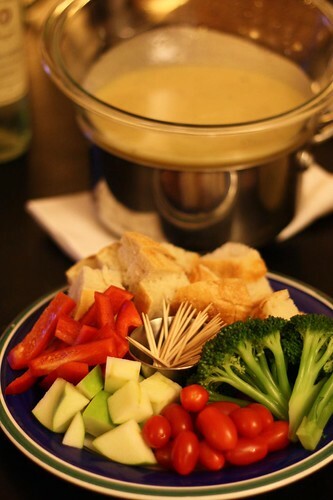 I did, however, make an authentic Swiss fondue (recipe from Culinaria) and served it with some bread, grape tomatoes, red peppers slices, and blanched broccoli. The recipe calls for garlic, Gruyere, Emmental, white wine, lemon juice, cornstarch, pepper, and nutmeg. It was tasty but I think I may use less kirsch next time. Either that or use a slightly better quality kirsch. At least better than the worst ever quality kirsch I purchased in 1998. 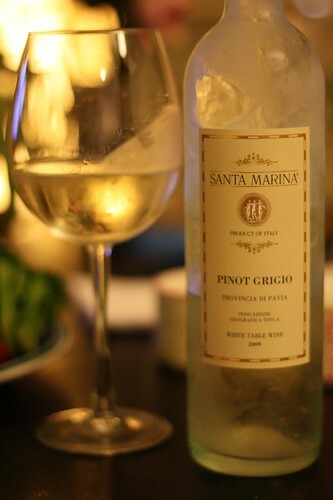 I used pinot grigio in the fondue recipe and Jen had it to drink because she was terrified of the drink I was planning on serving with the fondue. 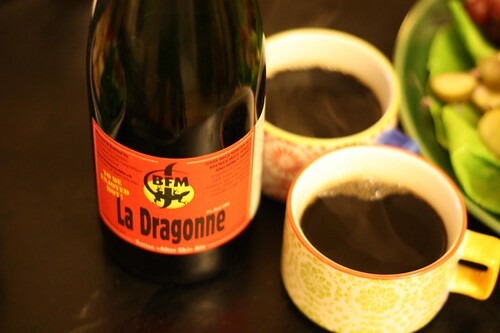 The drink I served was this warm beer called La Dragonne. It is an uncarbonated beer intended to be served warm. I heated it up per the instructions, poured it into mugs, and after one sip was pretty sure I wouldn't be able to have any more. I made it through dinner then poured myself another mug which I thought I would try to drink while I watched TV after dinner. I could only get a few sips into it and I had to stop. I really tried to give this classic Swiss "after ski" drink a go but I just couldn't get through it. The taste reminded me of one of those bitter herbal coffee substitutes like Teeccino. The idea of this drink was a very romantic one. I really wanted to fall in love with this drink. However, I found myself unable to drink more than five sips without giving up on it. I felt very virtuous for giving such a solid effort. 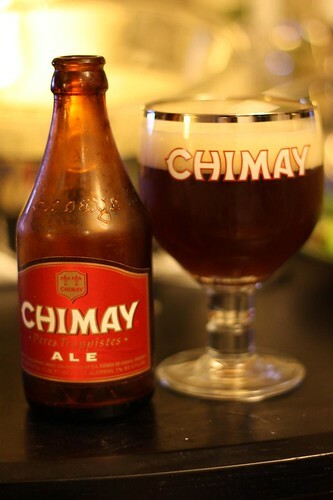 So, like I do whenever I feel such pride, I rewarded myself with a glass of Chimay. Unfortunately the Chimay tasted a bit of malt, spelt, sugar, hops, yeast, cinnamon, star anise, orange peel, cloves, cardamom, coriander, and juniper berries. In case you're wondering, this weekend is exactly what I think Switzerland is going to be like. I can't wait! Except for the warm beer part.